"Back to the pine trees" literally or figuratively? In terms of weaving, a little of both, I think. I have been very busy with family activities and guild business (is anyone else's guild faced with budget problems this year???) Consequently I have really missed weaving. Every day I've looked at my warping board with it's partially measured warp and thought, "tomorrow I'll finish that." Well, you know the saying, "tomorrow never comes," so I finally had to say, "today I'll finish that"! 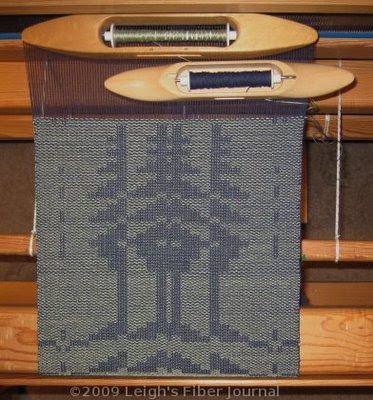 This is going to be a table runner in a summer & winter pine tree draft adapted from Carol Strickler's A Weaver's Book of 8-Shaft Patterns (#549 page 155). It the same pattern as Jane's antique coverlet. This is not a brand new project for me, rather it is a second try of this (click here) project, which I ended up cutting off the loom unfinished. I had too many warp ends break the first time. This time I've tied-on a stronger 8/2 cotton, one that I've used before as warp so I know it won't break. The old, weaker navy warp has turned out to be fine for weft. The two navies are slightly different, but together give more color depth to the final cloth. Even though my first go-round with this pattern was a warp disaster, it still serves a useful function as a sample for my project book. And so far there's been no warp end breakage and I'm really happy about that! Oh Leigh, this is looking wonderful! Am so glad you cut the other warp off so that you could weave this pattern up and enjoy it rather than feel frustrated. It does have to feel great being back to your loom, I empathize with the feeling of too many away from loom projects demanding attention. Mine are over though, so this is my year to weave! Our guild is in good shape financially, knock on wood. We had several major projects in the last two years, but did a lot of fundraising to defray costs. How is yours with new membership? It seems as if we pick up just 2-6 new members per year on average. Absolutely gorgeous. Our miniature group may cancel our annual show due to budget issues. I feel you on that front. Thank you Laritza! Thank you Jane! Thank you MiniKat! The photo isn't the best. I took it late at night with a flash, which doesn't do the colors justice. But I'm really enjoying weaving it. Our guild has grown a little each year so that in 2008 we had 144 members on our roster. This year though, some people have already mentioned not renewing their membership. Then again, we've already had a few new members this year. The real problem is a huge increase for renting our meeting space. So huge we'll either have to almost double annual dues, or find someplace new to meet. It's great that you found a warp yarn to work for you this time. I may not have perservered as you have. I feel your pain with regard to guild business. I have kind of dropped out of guild activity because I have found plenty of people are ready to volunteer, unless it is for a leadership position. Then, when someone else agrees to take the leadership position, the others come out of the woodwork to second guess everything. It was an unpleasant spot to be in. I have always loved pine tree in summer and winter and your's is beautiful. I think all non-profits are having a tough time. Good luck. Our guild is struggling with finances as well. We had kept annual dues at $15 but just raised them to $25, which still seems reasonable. I've missed weaving too. I'm hoping to have a few minutes in the studio this coming Saturday. Lovely weaving! I'm so glad you were able to get back to it.